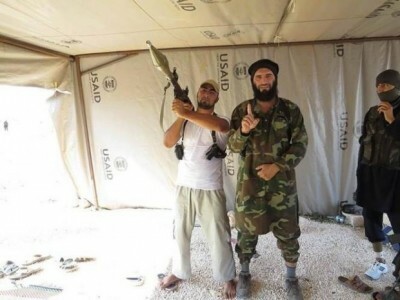 A photo circulating that purports to show Islamic State of Iraq and al-Sham (ISIS) linked Commander Muhajireen Kavkaz wa Sham inside a USAID tent. If this image is real, then it confirms the worst fears about U.S. aid to Syria falling into the hands of terrorists. The photograph allegedly shows Islamic State of Iraq and al-Sham (ISIS) linked Commander Muhajireen Kavkaz wa Sham, along with other rebels dawning battle-gear and an RPG, inside a USAID tent. The terror group is known inside Syria by its acronym, ISIS. It is an Al Qaeda-linked jihad organization and recently it announced a campaign of “cleansing evil” at pro-Western opposition groups inside Syria. The authenticity and location of this photo obtained by TheBlaze, which is circulating on the web, has not been officially confirmed. U.S. officials, however, told TheBlaze that this rebel commander is believed to be in Syria at this time.